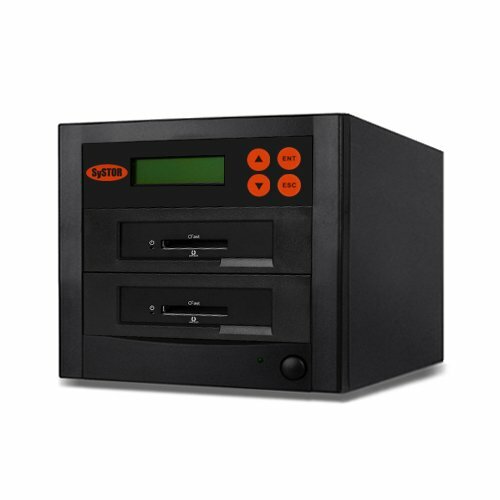 Overview: New CFast duplicators easily and reliably create multiple copies of your CFast storage devices without a computer. Each CFast channel has dedicated data copy throughput of 60MB/s or higher. Source Analysis feature can identify the content on the master and intelligently copy only the data to speed up copy cycle. Fast, reliable and convenient, CFast duplicators will help you to get more done in less time! High speed copy up to 60MB/sec. Unique Source Analysis feature. Complete Standalone; no computer or software required. User friendly interface, simple operation and cost-effective to operate. Multiple copy modes with fast copy (data only) and whole capacity copy. Real-time display of detailed information. No warm-up or cool-down required. Light weight, heavy-duty, durable construction. User friendly ergonomic, portable design makes daily tasks easier. Specifications: Operating Type : Complete Standalone (No PC Required) |No. of Targets : 1 | Supported Media : CFast Storage Devices |Transfer Speed : 60MB per second or higher | Buffer Memory : 256MB | Copy Mode :Fast Copy (data only), Whole Capacity |LCD Displays : 2 x 16 characters (Backlit) |Power Requirements : 115V or 230V | Operating Temperature : 41°F ~ 122°F |Operating Humidity : 15°F ~ 90°F |Regulations : FCC, CE. If you have any questions about this product by Systor Systems, contact us by completing and submitting the form below. If you are looking for a specif part number, please include it with your message.